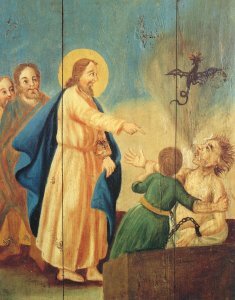 Jesus healing a man in chains who has epilepsy. In the Hunsrück there are a number of small baroque churches whose architecture was influenced by Lutheranism. The inner architecture and the fittings as well as the sparse painting is often of a stirring naivety. In some places one finds pictures portraying the life of Christ in rustic style painted in rich colours onto the boards of the gallery balustrade. The idea behind the paintings was usually a well-thought-out, educational, theological programme which aimed at teaching the mostly illiterate parishioners about the stories in the Bible and their meaning. It is not certain whether the tablets on the church in Krummenau were made in the workshop of Johann Georg Engisch, who also painted the pictures in the Lutheran church in the neighbouring village of Dill. The portrayal of Christ healing the boy with epilepsy has something lovingly childlike about it. The smiling figure of Christ looks joyfully at the little dragon with the striped tail as it shoots out of the mouth of the sick boy. Jesus’ disciples also watch the event with a smile on their lips. There is hardly any other portrayal of Christ which shows him experiencing as much pleasure at successfully healing someone as he does in this picture. The chain on the left lower arm of the sick boy symbolises the fate of many people who had epilepsy in previous centuries: because they were believed to be a danger to the public, people with the disease were often locked away in prisons or dungeons, kept in ‘lunatic asylums’ or were shut up in the cellars or in dark rooms in private houses. In the Middle Ages the ‘dishevelled hair’ motif was often used to show that a person was ‘possessed’.